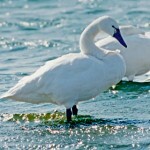 Description: White head, neck, and breast. Black back. Bill has orange swelling at base of upper mandible, pale green below eye, and gray cap. 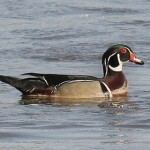 Female is brown, with V-shaped markings on side. 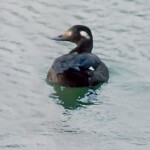 First winter male has a brown head. Habitat: Breeds on arctic tundra. Winters on both coasts. Where in Nebraska: Accidental in fall. Was photographed at DeSoto National Wildlife Refuge in 1985. Field Notes: Full adult plumage is not attained until the fourth winter. 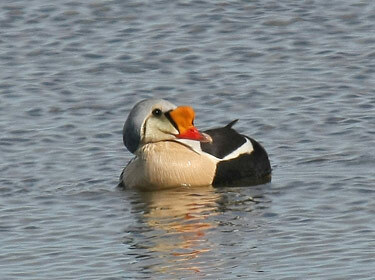 Fun Facts: King Eiders can dive up to 150 feet underwater.